A new public opinion poll released by Now or Never PAC today shows longstanding Texas Congressman Ralph Hall trailing by 12 points to former U.S. Attorney John Ratcliffe in the east Dallas district. According to the PAC, the polling now justifies its “plans to invest resources” in support of Ratcliffe’s bid in a release obtained by Breitbart Texas. According to the poll, Rep. Hall trails 47% to 35%. The PAC also focuses its findings on the metric that claims 67% of Republican voters in Texas’ 4th Congressional District are ready for a new voice in Washington. “Hall was elected in 1980, the same year Pac Man debuted and Jimmy Carter was still President. 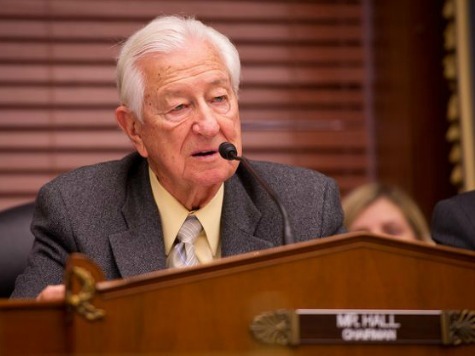 After 34 years in Washington and voting repeatedly for debt ceiling increases and wasteful earmarks, voters are ready to bring Ralph Hall home,” the release stated. Ratcliffe’s campaign unsurprisingly touted the new numbers in a press release submitted to Breitbart Texas today. Ed Valentine with the Hall re-election campaign told Breitbart Texas not so fast. Indeed, Rep. Hall claimed 46.24% of the 2014 Joint Primary voters, compared to Ratcliffe’s 28.54 percent according to the Texas Secretary of State. The Hall camp expressed great confidence in their ongoing effort to court former primary challengers for endorsements. The Hall campaign has worked in recent weeks to address the charge that the congressman is too old. Using a light-hearted approach to the subject, Rep. Hall touted his aged, wrinkled face thanks to decades of “battling Nancy Pelosi” and “taking on the liberals” amid 2nd Amendment rights battles. Bob Price (@BobPriceBBTX) contributed to this report.